Explore, Learn, Have Fun! 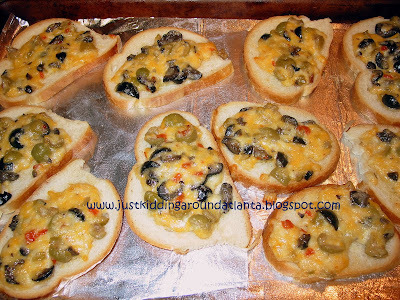 : My favorite Pioneer Woman recipe ~ OLIVE CHEESE BREAD! My favorite Pioneer Woman recipe ~ OLIVE CHEESE BREAD! One of my most favorite foods in the world is the tiny little salty, savory olive. I like them black, green, stuffed, not-stuffed, kalamata - you name it. I add them to everything, and you will always find cans of black olives and jars of green olives in my kitchen! I never ever run out of olives! Did I mention that D (aka Mr. Picky Pants!) loves them too? Yes, & he got that from me! Let's see - I put them in our taco meat, spaghetti sauce, casseroles, on top of nachos, pizza, salads - you name it, there's probably an olive variety in there when you're at our home! So when I saw that Mario Foods was offering bloggers on Facebook the chance to review Their new On-The-Go Snack Olives, I quickly sent in my request! I was thrilled when they sent us a sampler box filled with a variety of their delicious snack olives, "packed loose without the juice". These olives come in a perfect snack size pouch that you can tuck in a lunch box or even in your purse! 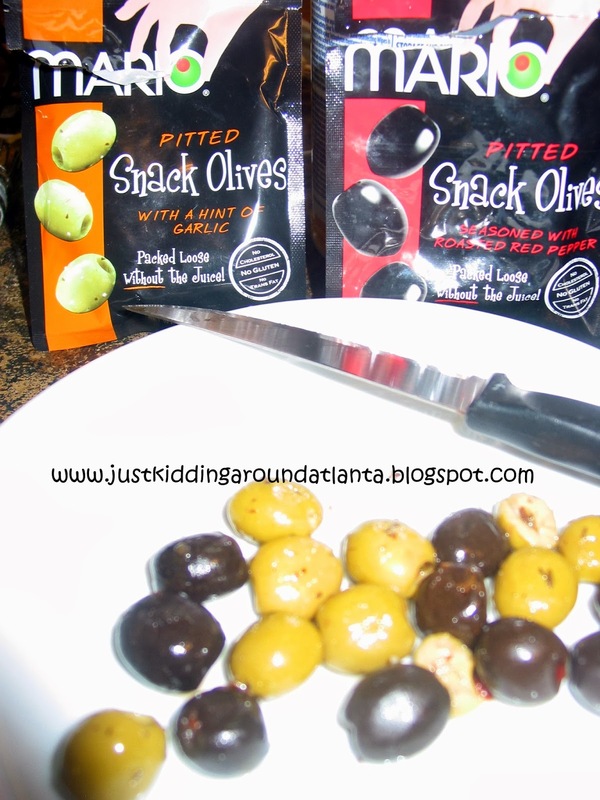 They sent us black olives with natural sea salt, black olives seasoned with roasted red pepper, green olives with natural sea salt, green olives with a hint of garlic, and green olives with a hint of savory pepper. (They also have olives seasoned with Sevillian spices, and kalamata olives seasoned with a hint of thyme). Oh my gosh, are they all delicious! My son was hooked immediately! He loved eating the olives on Ritz crackers ~ the garlic and the red pepper varieties were his favorites! Spicy and salty and wonderful - just like you'd expect! So tasty! Want more Mario olives in your life? Check out some of the great recipes Mario Foods has for you to try! I saved a few packs to use on our first cold evening, when I made a pot of turkey chili. I decided that Pioneer Woman's Olive Cheese Bread would be perfect as a side! It is one of our family's favorites, and I've shared it here before. Slice the french bread in half lengthwise, spread the olive cheese mixture in an even layer on each half. Bake 20 -25 minutes, until cheese mixture is thoroughly melted and beginning to turn light brown and bubbly. Cut into diagonal slices and serve immediately!! 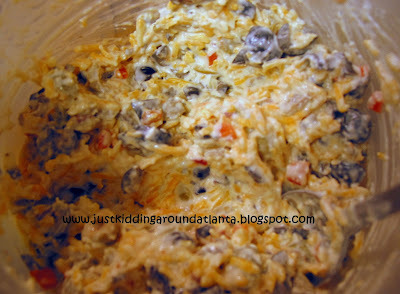 You can make the cheese/olive mixture up to 2 days in advance, store tightly covered in fridge. Or spread mixture on bread and freeze , tightly wrapped for up to six months. Thaw before baking. Also super-good on crackers! 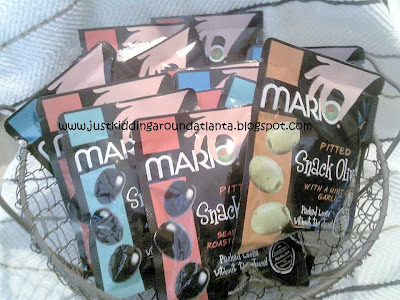 The night I made our chili, I swapped some of the regular black and green olives out for the delicious On-The-Go Snack Olives from Mario Foods. I used one pouch of the green olives with a hint of garlic and one pouch of the black olives with a hint of roasted red pepper. Wow - did they ever jazz up this bread! SO fantastic. I'll be making it this way from now on! 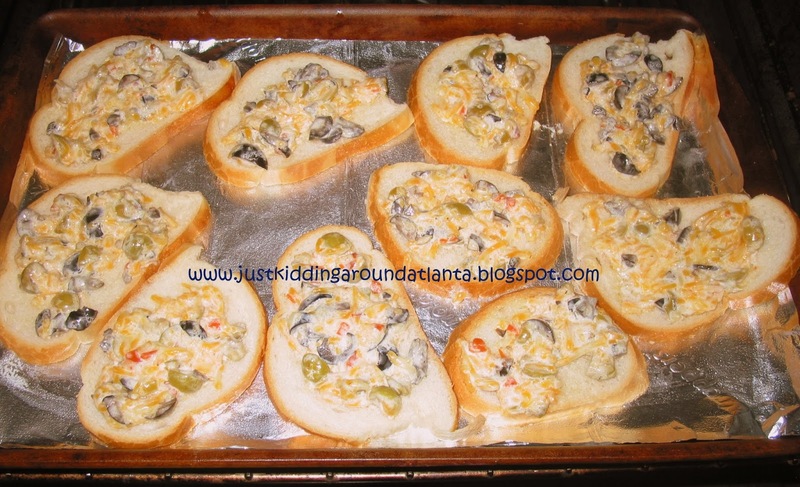 Even D. liked my new and improved version of Olive Cheese Bread. It was perfect with the chili! New additions to my recipe! See all the spices and herbs? Tasty stuff! Everything gets mixed up together. 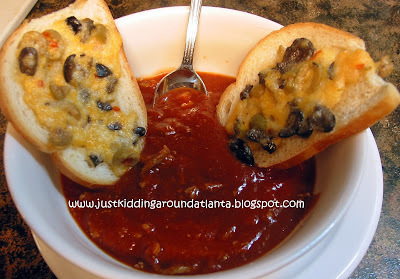 Perfect for dipping in my turkey chili! I also used the black olives with sea salt on Halloween night - I chopped them up and put them in a hot pizza dip. I left one out til the end and cut it in half to use as a big fat spider on top! (half of the olive was the body, and the other half I cut into 8 thin slivers for legs! I used a bag to pipe some alfredo sauce on top of the dip and then swirled it a little to make a web design, and the scary little olive spider went right in the middle! See it in the pic below, on the left? These olives are not only delicious for a snack, they are quite versatile for using in recipes! I'm hooked. We'll be sure to keep these in our pantry! Here's where you can find all the yummy Mario Products for yourself! Ready to enter my contest? 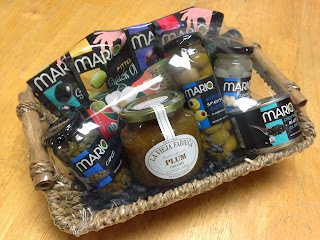 Click the link below and enter to win a fantastic gift basket of goodies from Mario Foods. Items in the basket may vary from the picture above, & it is valued at appx $30. Get 10% off sitewide when you shop at www.AccessHydro.com. Valid until December 2013. 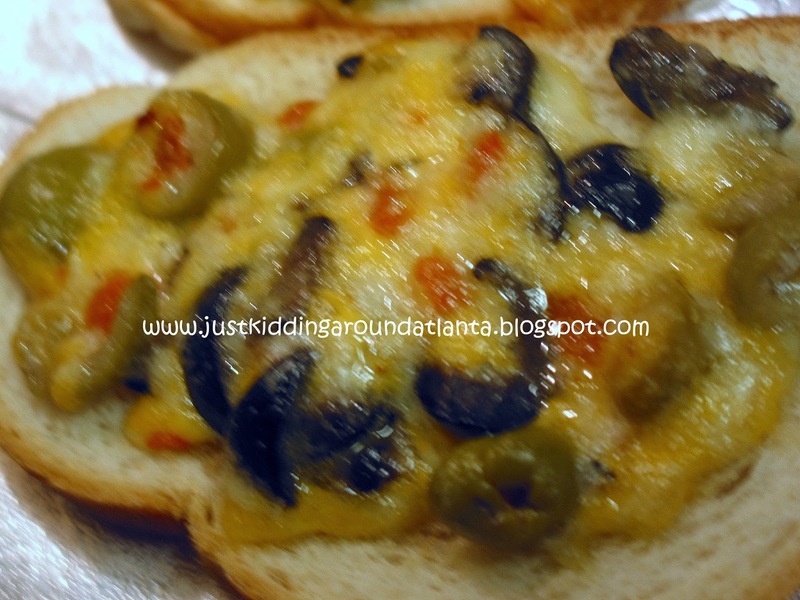 My hubby would love the black olives with a hint of roasted red pepper! I like just plain old olives! I love Olives any time any way and these recipes look delicious! I'd love to try the black olives with a hint of roasted red pepper, I will be on the look out at my grocery store. I'd like to try the green olives with a hint of garlic. I don't really care for olives myself, but my husband loves them, and will eat any kind of olive, so I don't know which one he may want first out of the choices. Green with a hint of pepper sounds good. I'd love to try the black olives with a hint of roasted red pepper! Any of them, but the Black Pitted Seasoned w Natural Sea Salt or seasoned with Red Pepper looks good to me! I'd like to try the Green Sevillian Spices. 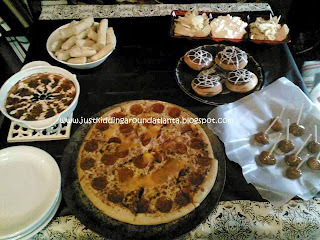 My family and i love olive and would enjoy all of these products for the holiday! The black olives seasoned with roasted red pepper sounds good to me. I'd like to try the hint of thyme Kalamata olives first! Would love to try the black olives w/a hint of garlic, but they ALL sound delicious!!!! Great recipe, I will have to try this, thanks for the chance! First I'd try the " With a Hint of Garlic" variety! I'd like to try the With a Hint of Garlic. Wow! Best olives in the world! love Mario Olives! Red Pepper are my fav! I want to try the green olives with sea salt. I most want to try the green olives with a hint of garlic. 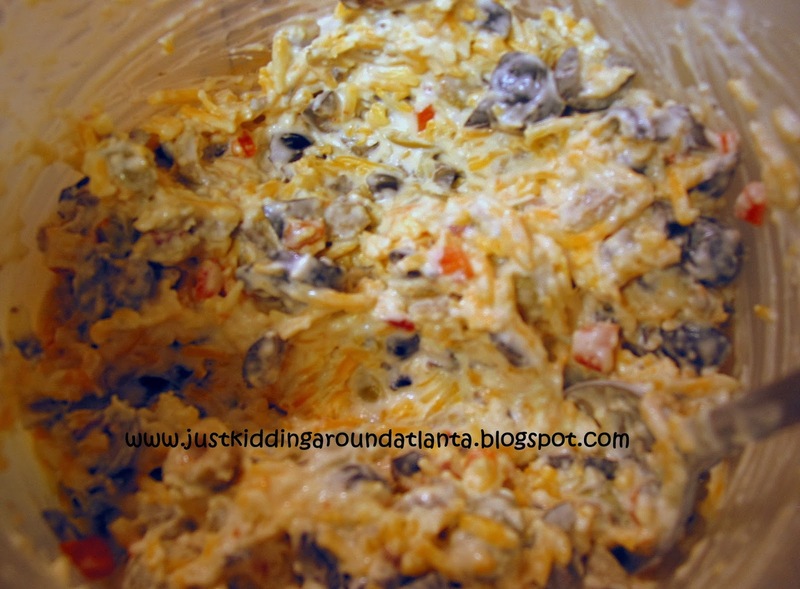 My mom makes an amazing pasta salad with olives these would be perfect for that! I love them all except I hate anything spicy. Love Olives! Would love to try the ones with red pepper..the spicier the better for me! I would love to try the Roasted red pepper flavor! I would like to try the PITTED SEASONED W NATURAL SEA SALT, GREEN! I'd like to try the Pitted w a Hint of Thyme, Kalamata.